Brandywine is a large fruited (most fruit in the one pound range), potato leaf, pink heirloom tomato that has taken on legendary status due to its potentially superb flavor. However, because many individuals have become involved with growing the variety, saving seed and sharing it with others, it seems as though numerous "selections" and/or sub-strains are now "out there" (some of which are inferior in flavor or performance), with no easy way of knowing which strain you have. To further complicate matters, there are a number of cultivars with "Brandywine" as part of their name – and some of these are showing variability, due to inadvertent crossing or selecting. Brandywine – indeterminate, pink fruited, large fruit, oblate shape, some green shoulders, some ribbed shoulders, some cracking, yield can range from how to relatively high, potato leaf, meaty, flavor from insipid to superb. The key question is whether Brandywine was a family heirloom that arose from a commercial variety via selection, or was brought from overseas. The first tomato of a similar description to appear in seed catalogs is Turner’s Hybrid (Burpee) or Mikado (Henderson); it is not clear as to whether these are the same tomato with one company renaming it, or two tomatoes that are very similar. Johnson and Stokes also introduced a variety called Brandywine. An old Burpee catalog (1892) described it as a red tomato that is "inferior to Matchless" (a red, medium large sized Burpee variety). I would love to see the pages from the three catalogs when Turner’s Hybrid, Mikado and Brandywine were introduced to read the exact descriptions. (note: I need to do more research on the above and verify dates, since they do not make sense). 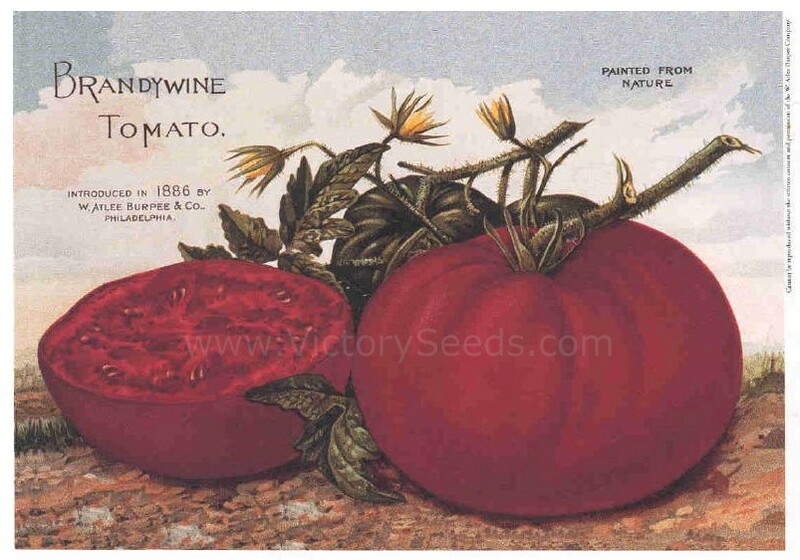 Once word of the supreme flavor of Brandywine got around, it became the most popular of the heirloom tomatoes offered via the SSE yearbook, and even found its way into a number of mainstream seed catalogs, such as Stokes and Parks. What is clear is that at least one selection, sold by the defunct Tomato Seed Company of Metuchen, New Jersey, has consistently inferior flavor. The strain carried by Johnny’s Selected Seeds came from a seed donation by me – I received the variety from Roger Wentling of Pennsylvania in 1986. He in turn received the variety from Ken Ettlinger of the Long Island Seed and Plant company. Ken received it from Ben Quisenberry, thus the JSS strain is the Quisenberry/Sudduth strain. There is an inaccurate relist of the variety in the SSE yearbook – because I got the strain from "PA WE R", one seed saver relisted it as Pawer’s Brandywine, thus illustrating how names can be improperly perpetuated. Yellow Brandywine – indeterminate, golden fruited, large fruit, oblate shape, some green shoulders, some ribbed shoulders, some cracking, yield can range from low to high, potato leaf, meaty, flavor intense and on the tart side. History: I received seeds of Yellow Brandywine from Barbara Lund of Ohio in 1991. Barbara claims she received the variety from Charles Knoy of Indiana. I sent this variety to Rob Johnston, and that is the strain carried by Johnny’s Selected Seed. In looking at the seed catalog literature, the only tomato listed which matches closely the description of Yellow Brandywine is an old Henderson variety listed in 1890 called Shah – described as a gold fruited sport from Mikado. (NOTE: William Woys Weaver, in his book, draws the inaccurate conclusion that Shah is a medium sized cream or white tomato). Platfoot Yellow Brandywine (first listed in 1996) – some have found that this selection of Yellow Brandywine by Gary Platfoot gives smoother fruit and a better yield. I have not yet grown this particular strain, but Carolyn Male and others find it to be better than the regular YB. Red Brandywine – indeterminate, red fruited, medium to medium large fruit, slightly oblate shape, uniform ripening, some slight ribbing, fairly crack tolerant, regular leaf, juicy, consistently high yields, well balanced fine flavor. History: Red Brandywine first appeared in the 1984 yearbook, but was a mis-listing of the pink potato leaf variety from Ben Quisenberry ("Brandywine" itself). There was, and continues to be, different usages of color when referring to tomatoes – for example, some seed savers list pink tomatoes as red, others list pink tomatoes as purple. ALL listings in the Tomatoes: Red category of the SSE yearbooks prior to 1988 (whether listed as Brandywine or Red Brandywine) were of the pink potato leaf variety. The first listing of the red, regular leaf, authentic strain of Red Brandywine was in 1988 – listed by Steve Miller, who got the variety from Tom Hauch of Heirloom Seeds. (In his seed catalog, Tom states that this tomato originated with Chester County, Pennsylvania farmers in 1885). From my review of all of the SSE yearbooks, it is clear that many listings under Red Brandywine were, and still are, a mis-listing of Brandywine (the pink potato leaf tomato). Though there are often 20 or more listings of Red Brandywine in some yearbooks, no more than 12 listings are the regular leaf, red, authentic variety -–the rest are misplaced listings of Brandywine (the pink potato leaf one). To make matters worse, improper seed saving has led to the recent appearance of a red, potato leaf variety that is probably a selection from a cross or a mislabeling of some other variety. Thus the Brandywine story continues to become more convoluted all of the time. OTV Brandywine (first listed 1997, stabilized from Carolyn Male from a cross of Yellow Brandywine that appeared in my garden – it is a potato leaf, large fruited orange red tomato of excellent flavor). Black Brandywine – indeterminate, dusky rose/purplish fruited, variable shape, from small to medium to large, oblate shape, some ribbed shoulders, some cracking, both potato and regular leaf, indicating an unstable strain, variable yields, variable flavor. Some people have had great success with it, others, such as me, got nothing more than a small, ugly, poorly flavored "bag of tomato seeds and gel" from my one experience with it (growing out one plant of potato leaf, one plant of regular leaf, neither one being very good). History: First listed in the SSE in 1999, seed saved from a variety offered in 1998 for the first time by the Tomato Seed Company – apparently a single plant selection in a field of Brandywine being grown out by the California company Seeds by Design. It is surmised that it originated by an accidental cross of Brandywine with a regular leaf "purple/black" tomato such as Cherokee Purple or Black from Tula. Red Section: Red Brandywine (1 listing, FL ST G, WI HO S 84, potato leaf pink). Pink Section: Brandywine (22 listings). Listed in the Red section: Red Brandywine (1 listing – FL ST G, from WI HO S 84) – possible incorrectly listed – as potato leaf, large fruit. Listed in the Pink to Purple section: Brandywine (23 listings) – earliest listing OH QU B (Ben Quisenberry) 1980 – all listed as pink potato leaf, large fruit – but Quisenberry strain quoted as being best flavored. No listings for Yellow or any other Brandywines. Listed in Red section: Brandywine – 1 listing, no description (MD MA B). Listed in Pink to Purple section: Brandywine (29 listings) – all pink potato leaf. Amish Brandywine (1 listing) – MO BR E, who got from George Pesta, WV 1985, large pink potato leaf. Listed in Red section: Red Brandywine (2 listings, AR KI F – 10-12 oz red, but grown out as a potato leaf in 1989; OK ST F from FL ST G – potato leaf). Plum Shaped Brandywine – CA BR D, plum mutation. Listed in the Pink to Purple section: Brandywine (36 listings). Listed in the Red section: Brandywine (3 listings, all potato leaf). Red Brandywine (2 listings, both potato leaf). Listed in the Pink to Purple section: Brandywine (34 listings). Listed in the Red section: Brandywine (3 listings, one of which as wed and small, CA BR D, as a form of Brandywine). Brandywine, Heart shaped (1 listing, CA BR D, from NY RI R, as a mutation). Red Brandywine (2 listings, including first reference to Heirloom Seeds source (Tom Haush), PA MI S of Landis Valley, described as an excellent, best tasting tomato that originated in Chester County – the other described as potato leaf). Listed in the Pink to purple section: Brandywine (29 listings). Brandywine Sport (1 listing, WI BA L, small egg shaped pink, from a NGA member). Red section: Brandywine (3 listings, all potato leaf). Heart Shaped Brandywine (1 listing, MO WA C, reg, leaf, solid, like a paste tomato, from CA BR D). Red Brandywine (5 listings, OH KN C from PA MI S – only 2 the red variety, rest are potato leaf). Pink to purple section: Brandywine (26 listings). Brandywine, Pink (1 listing, by PA MI S, from CA ES C 86). Yellow to Orange section: Yellow Brandywine (1 listing, OH LU B, potato leaf beefsteak type, from Knoy, Indiana, 1985). Red section: Brandywine (2 listings, both potato leaf). Red Brandywine (8 listings, at least 4 potato leaf pinks, starts to get confusing). Pink section: Brandywine (33 listings; Miller’s Pink BW listing moved into this section). Yellow section: Yellow Brandywine (1 listing, PA LE C, from OH LU B). Red section: Brandywine (6 listings, 4 potato leaf, 2 without detail). Red Brandywine (7 listings, 3 potato leaf, 4 without detail but 3 probably regular leaf red). Pink section: Brandywine (35 listings). Yellow section: Yellow Brandywine (6 listings). Red section: Brandywine (5 listings, 3 potato leaf, 2 without detail). Red Brandywine (7 listings, 3 potato leaf, 3 probably the regular leaf red). Pink section: Brandywine (34 listings). Brandywine, Pawer’s (1 listing, MO WA C, incorrect, since it is from me, who got from PA WE R – he took the listing code for the name). Yellow section: Yellow Brandywine (11 listings). Red section: Brandywine (5 listings, 2 described as potato leaf, one as an old fashioned tasting red). Red Brandywine (10 listings, 3 potato leaf, 4 probably the red regular leaf version, 3 not described). Pink section: Brandywine (41 listings). Brandywine, Radiator Charlie’s (1 listing, listed as aka Brandywine, Amish, from MO BR E who got from George Pesta, who got from Totally tomatoes – obviously erroneous). Brandywine, Joyce’s Strain (1 listing, a selection for earliness by Chuck Wyatt). Yellow section: Yellow Brandywine (15 listings). Red Section: Brandywine (2 listings, one as red, one no detail). Red Brandywine (17 listings, 8 potato leaf pink, 8 regular leaf red). Pink section: Brandywine (48 listings, all pink potato leaf). Brandywine, Joyce’s Strain (2 listings). Brandywine, Sudduth’s (1 listing, Heritage Farm listing, Tomato #2, orig. from TN TE J). Yellow section: Yellow Brandywine (14 listings). Yellow Brandywine, Platfoot (1 listing, Carolyn Male, who got from Gary Platfoot, Ohio, as a more uniformly shaped strain). Red section: Brandywine with no modifier is no longer listed. Red Brandywine (25 listings, 8 described as potato leaf pink, most of rest are the red regular leaf). Brandywine Mutate #1 (1 listing, MO WA C from CA BR D). Brandywine Mutate #2 (1 listing, MO WA C from CA BR D). Brandywine, OTV (1 listing, Carolyn Male, stabilized and named by Carolyn from a cross between Yellow Brandywine and ??? in Craig’s garden; seed sent to Craig by a seed saver). Pink section: Brandywine (50 listings). Brandywine Mutate (1 listing, MO BR E from CA BR D). Brandywine, Joyce’s Strain (5 listings). Brandywine Sport (1 listing, Heritage Farm listing). Yellow section: Yellow Brandywine (20 listings). Yellow Brandywine, Platfoot (3 listings). Red section: Brandywine, Heart-shaped (3 listings). Red Brandywine (21 listings, 6 pink potato leaf, most of the rest red regular leaf). Pink section: Brandywine (51 listings). Brandywine, Joyce’s strain (7 listings). Brandywine, Sudduth's (3 listings, one misspelled as Suddeth’s). Brandywine Cherry (1 listing, MO DI T, pink delicious cherry). Yellow section: Yellow Brandywine (22 listings). Yellow Brandywine, Platfoot (6 listings). Red section: Brandywine, Heart-shaped (5 listings). Pink section: Brandywine (49 listings). Brandywine, Glick’s Strain (3 listings, original introducer Darrell Merrill, who got from William W Weaver, claims it is the original Brandywine, via Glick in Gap, originally from Johnson and Stokes company). Brandywine, Quisenberry (1 listing, from Darrell Merrill, TO 7 from the SSE collection). Yellow section: Yellow Brandywine (19 listings). Yellow Brandywine, Platfoot (7 listings). Other colors section: Black Brandywine (5 listings, came from TGSC). Red Section: Brandywine (1 listing, pink potato leaf). Red Brandywine (22 listings – 12 of which are red regular leaf, rest seem to be pink potato leaf ). Article text copyright © 2002 by Craig LeHoullier. Reproduction in part or full without prior permission from the author is prohibited.